I have never before worked with a pin that is this thin. It is very, very skinny and very sharp. You can see the size in the photograph. Because the head on these pins is so small I find that I like to spill the pins onto a piece of felt, making it easier to pick them up. There are 45 pins in each little plastic tube. When the original Perfect Pins were being manufactured I requested a small size. The answer was no, we cannot do that. Sometimes it pays to keep bugging them. I love this smaller size. This needlethreader from Clover has to be the best needlethreader I have ever used. You simply place the needle eye down in the marked location, push on the lever, release and remove your threaded needle. It is simply amazing. I love this little threader. 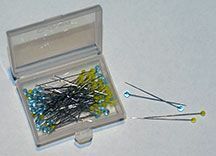 These extra-fine and very sharp pins pass smoothly through the fabric. 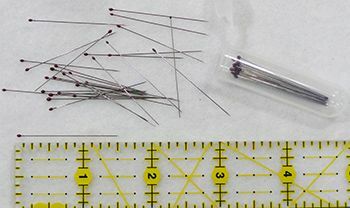 These pins are useful for pinning applique and piecing. The head is made of an iron-proof glass. They come in a handy closable case. 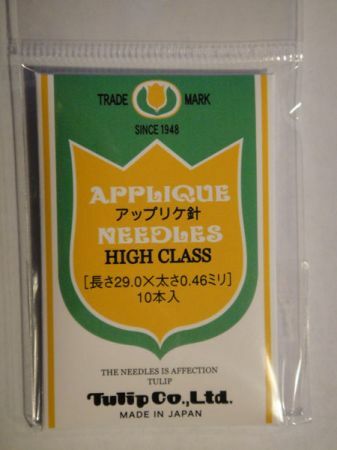 I love these needles for hand applique. They glide through the layers easily, even batiks. There are 10 needles per package. They are a size 11. Very thin with a nice sharp point. 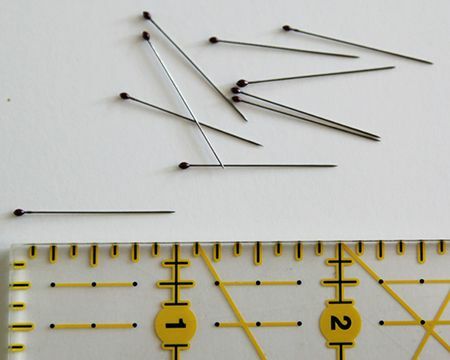 These needles are wonderful for hand appliqué. They do just what the title says; they glide right through your fabric. I am always looking for things that make my hand appliqué easier and these do just that. For machine sewing there is nothing I like more than Microtex Sharp needles. They have a thin, sharp point and give me a perfect stitch. I use the 60/8 for my machine applique along with the invisible thread from Sew-Art International. I use either 60/8 or 80/12 for machine quilting. It just depends on the thickness of the thread. For thinner threads you'll want 60/8. For medium threads you will want the 80/12. I also use the 80/12 for piecing. Love these needles.